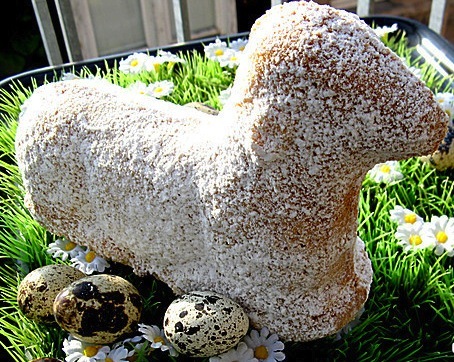 One traditional German cake for Easter is the Easter lamb cake. To make this special cake you would need a special baking lamb form, and we found some on Amazon. It's basically a cake similar to a pound cake, you could marbelize it add some lemon as a variation. Happy Baking! - Beat butter, honey and eggs until foamy. - Add vanilla and grated hazelnuts, mix flour with baking powder, add to dough, then milk and rum. - Take baking form apart. - Grease the form with a baking brush very thoroughly (use butter or oil); put it back together and sprinkle with bread crumbs. - Fill in the dough but don't fill it completely otherwise it will overflow during the baking process. - Bake on lowest level for 1 hour at 175 degrees C or 347 ; place a sheet of aluminum foil on top after 30 minutes, so it won't get too brown. Is this a German tradition? In Chicago, lamb cakes at Easter are everywhere. Other parts of the USA, nobody knew of this. Do you see this in Germany? Catheriine, my understanding is that it was originated by the polish people Like anything else ,a good thing,everyone else wants to join in on the bandwagon,even the Italians.